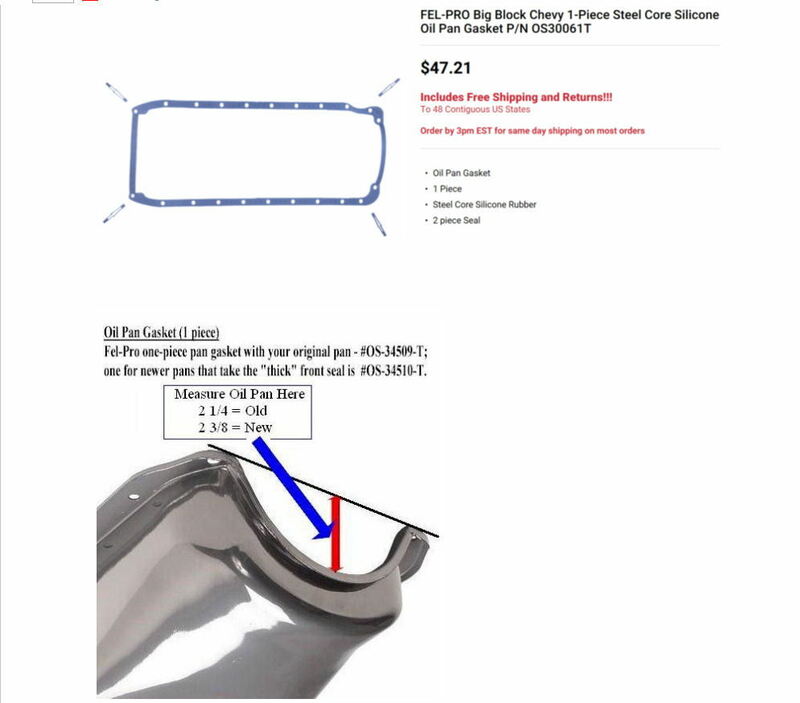 I’m going to change my oil pan gasket, and will order the Fel-Pro one piece pictured below. Question is: Will I run into any problems with this? It says 1 piece then it says 2 piece seal, not sure what that means. Also, the small block gasket pictured below had 2 different types, will I run into a fitment problem with the BB gasket? [My car is a 427]. 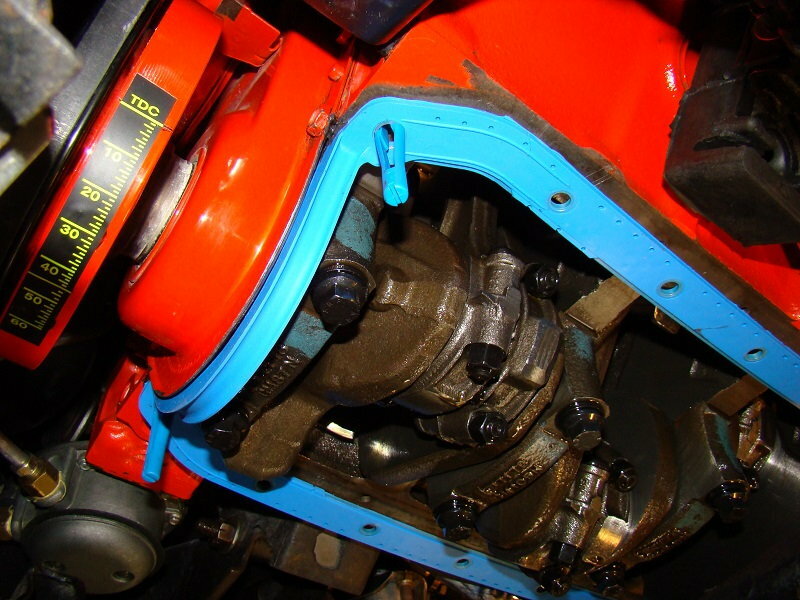 If your car has the original pan, order the gasket with the smaller radius. Many pans changed this dimension in the 1970's, so if your car has a later replacement pan, then order the one with the larger radius. I only remember this for small blocks, but big blocks may also be the same way. It is best to check pan first if any question. My friend bought the wrong one from local NAPA, and they exchanged it for him when he brought it back. Something to consider..........buying locally if in doubt. If what I remember, that front radius difference, thick/thin gasket only applies to small blocks. Last edited by Bluestripe67; 04-15-2019 at 11:36 AM. That's what I'm wasn't sure about. Just a comment, I like Fel Pro items, but the bright blue shows up, and paint doesn't really stick well to these rubber/silicone gaskets. Mr Gasket has the equivalent, in a black/dark gray color, with compression stops in the gasket and all. Actually the spec from Felpro is 8 ft lbs for the small bolts, and 18 ft lbs for the large (corner) bolts. As you'll see in this thread, mine held oil for 4 years...then developed a small leak. Re-torquing the bolts stopped the leak. Their oil pan gasket is 1-piece.. Likely discussing their rear main seal, which is 2-piece (has to wrap around the crank). Last edited by SDVette; 04-15-2019 at 01:53 PM. Since we're discussing oil pan gaskets, I've got a dumb question to ask the experts. I'm in the process of changing my oil pan out from a 4qt. to 5qt. I have the Fel-Pro one pc. gasket. The instructions say to put the gasket on the block using those plastic studs to hold it up. Seems to me it would be easier to lay the gasket down in the pan and raise it up and bolt it in. Otherwise I could see part of the gasket hanging down while your trying to line up the pan. The service manual tells you to lay the gasket on the block first also. Is there a reason to do it that way. I'm thinking that they assume that you have the engine in a stand up side down, which in that case makes sense to do it that way. Mabey I'm missing something here. I believe they say to seal around the front and rear curved areas of the block with some silicone. That may be one reason. And the pins they supply seem to hold this area secure. I remember helping my friend do this job and we also made up about 6 metal studs that we also screwed into the block temporarily to better help alignment during assembly. Used nuts on these when first pan installed until we got the regular pans bolts in on the remaining holes (finger tight). Then removed these temporary studs one by one and replaced with the correct bolts. Then tightened everything up to spec. Thanks Powershift. I was thinking about making some extra studs out of some cut-off bolts for this that reason. Just want to do this job once so I'll try to do it right. The gasket is stiff enough to allow the plastic studs to hold it up. This is a SBC but a BBC should be the same. Here is a pic of the studs and the gasket. The studs will also support the pan, just push it over the studs, and then you can install the screws. Thanks "Mike67nv", nice picture. Will do the same.